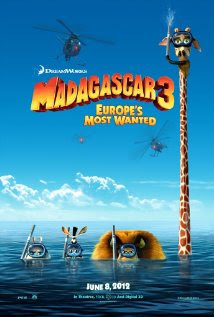 Animated family movie "Madagascar 3: Europe's Most Wanted" beat sci-fi thriller "Prometheus" to the top of weekend box office charts with $60.4 million. "Prometheus", an effects-filled film from "Alien" director Ridley Scott about a team of explorers who discover a clue to the origins of mankind, pulled in $50 million to finish second. In third place was action-filled "Snow White and the Huntsman", which debuted last weekend sold more than $23 million of tickets. Men in black 3 and marvel's the avenger completed the top five with $13.5M and $10.8M .